ISLAMABAD: Pakistan Tehreek-e-Insaf (PTI) Chairman Imran Khan has been elected the 22nd Prime Minister of Pakistan. Speaker National Assembly Asad Qaisar announced the name of the Leader of the House after vote count. Imran Khan secured 176 votes while Pakistan Muslim League-Nawaz (PML-N) candidate Shehbaz Sharif bagged 96 votes in the polling for the Leader of the House in National Assembly on Friday. The MNAs supporting Imran Khan gathered in lobby A while those supporting Shahbaz Sharif in lobby B. The speaker had designated booth A as voting booth for Imran Khan and booth B as voting booth for Shahbaz Sharif in the NA. Attired in white-shalwar qameez and black waistcoat, Pakistan Tehreek-e-Insaf chairman Imran Khan has also reached the parliament house. The polling process for electing prime minister of Pakistan has ended and the counting of the ballot is underway in the National Assembly. PML-N candidate for prime minister Shehbaz Sharif himself made efforts to woo PPP Chairman Bilawal Bhutto Zardari to vote for PM slot, but failed to do so. Pakistan People’s Party is abstaining from voting in the process of electing the prime minister. 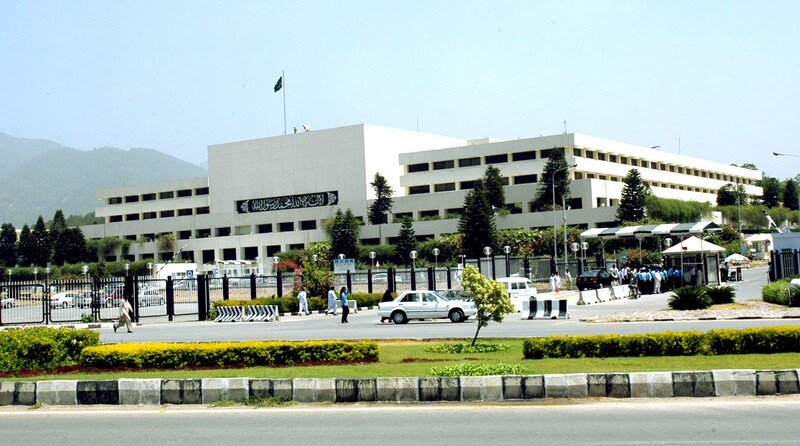 Voting for prime minister of Pakistan begins in the National Assembly, being presided over by Speaker Asad Qaisar. 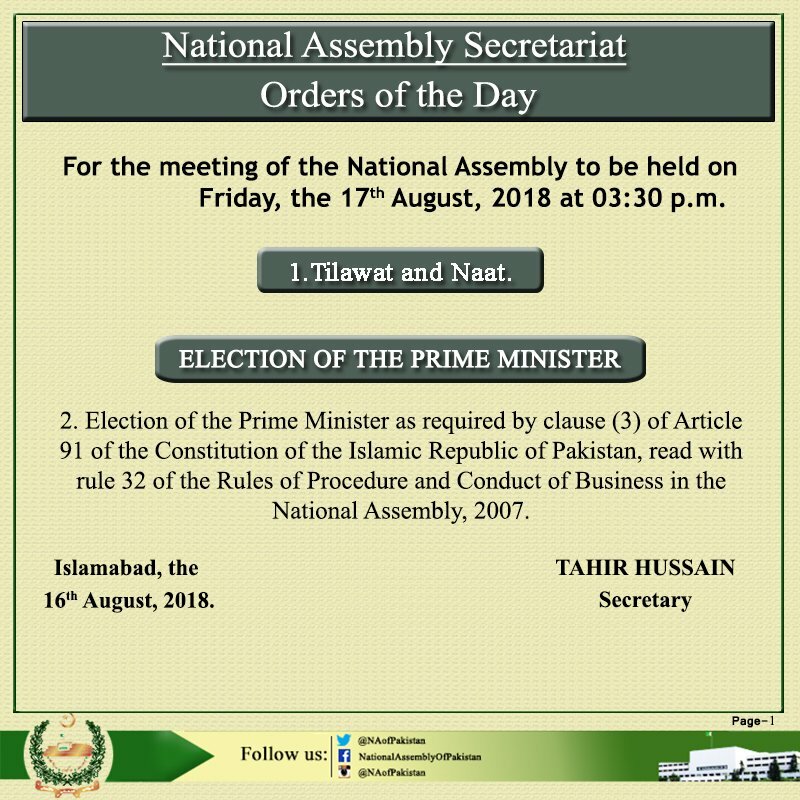 National Assembly session has started. 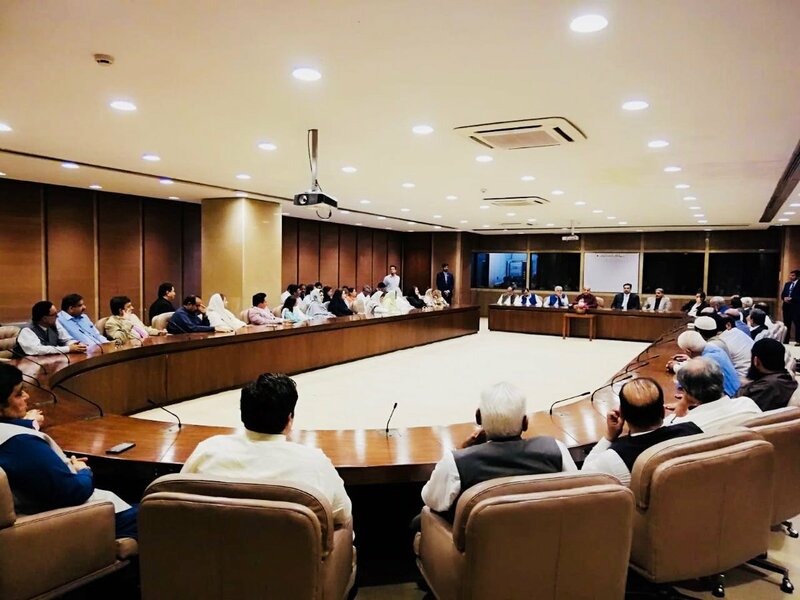 Pakistan Muslim League Nawaz has decided to protest in the National Assembly after the election of prime minister over alleged rigging in the last month election. Talking to media upon arrival at the Parliament House, former federal minister Ahsan Iqbal said PML-N's mandate was snatched in July 25 elections. Sheikh Rasheed said Pakistan is in critical phase of its history. When asked to comment about his propspects of being in Imran Khan's cabinet, AML chief replied:" I'm in best position". The PTI emerged single largest party in July 25 general elections and is all set to form government in center with the help of its allies. Imran Khan is required to receive 172 votes in the 372-member house . Analyst believe Khan is expected to secure 176 voters while his opponent Shahbaz Sharif 95 . The Pakistan People's Party has decided to abstain the vote expressing reservations over the nomination of Shahbaz Sharif. The opposition stand divided after it failed to filed a joint candidate against Imran Khan. The PTI on Thursday got its chief minister elected in Khyber Pakhtunkhwa for the second consecutive term while it is also expected to win the slot in Punjab.